Institute of Chemical Engineering and Technology, Tianjin University, Tianjin, China. Carbon emission is a problem of global concern because it scares humanity’s living. While CCS (carbon capture and sequestration/storage) strategy received global attention, some scholars argued that the present warming is just a natural step in a long range periodic change of climate. Here we show that it isn’t a natural phenomenon, nor is something controllable by the CCS strategy. 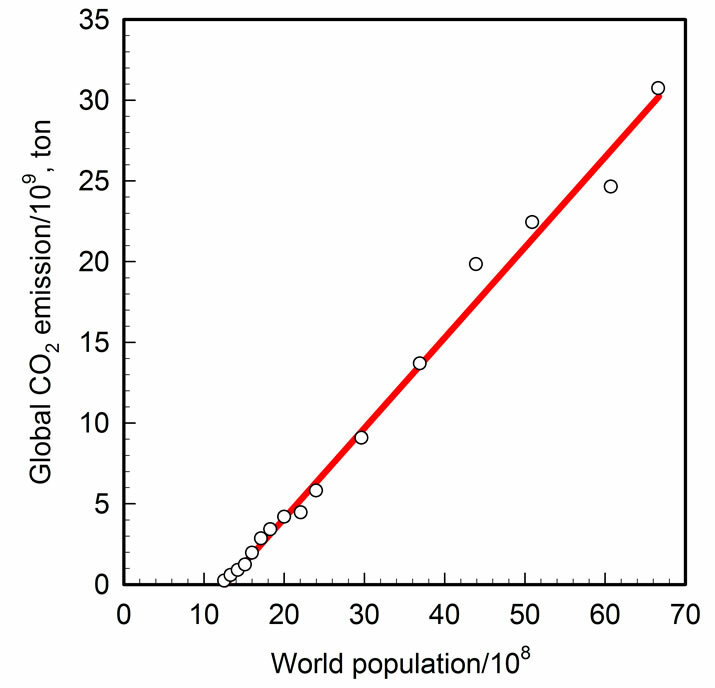 Carbon emission is governed by an ecological rule of the earth: global carbon emission is linearly correlated to the world population when the latter is larger than 1.3 × 109. Therefore, birth control is an essential component of low carbon economy. Carbon emission is thought of responsible for global warming and the hoist of sea level, abnormal weather, draught and flooding. People experience the change of the earth caused by global warming every day. Statesmen and politicians get together to discuss international treaties and carbon trades in order to restrain carbon emission. Scientists proposed CCS (carbon capture and sequestration/storage) strategy, i.e., capture the emitted CO2 and then sequestrate/store it somewhere underground or in deep sea, to deal with carbon emission. Innumerous money has been put on the strategy, although it is yet to pass a serious examination. The CCS strategy is misleading in deed. Firstly, capture of CO2 is possible only for concentrated emissions, typically those from coal-fired power plants. Power generation accounts for about one-quarter of total emissions of CO2 , therefore, the ever increasing trend of carbon emission cannot be stopped even for total capture of the power plants emission. Secondly, the strategy is economically impractical because the capture cost is too expensive to be accepted by power enterprises. A compilation of industry CO2 capture cost estimates is shown in Figure 1 . It just gives an idea of how much the cost could be, and the additional costs for transportation and sequestration of CO2 have not yet been accounted for. The lowest cost is 50 Canadian dollars per ton of CO2 abated, and 2.6 tons of CO2 is produced in burning a ton of power coal; therefore, 130 $ has to be added to the cost of burning a ton of power coal, which is more than the present market price of power coal. Nobody expects power plants will pay for such a large marginal cost. The gap between the marginal cost and the market price of generated power can hardly be mitigated by the expected progress of capture technology because the coal price must be getting higher as the rich mines are getting depleted. Thirdly, sequestration/storage of CO2 runs a danger of disaster. The compression work done on CO2 at storage largely converts to the internal energy of the gas. Therefore, a sudden explosive release of CO2 would be inevitable at unexpected geological or aerographic change/accident. CO2 is heavier than air; therefore, the huge quantity of CO2 will cover a wide area and stifle all people and animals beneath it. Such accident has happened in Cameroon and a hundred thousand people died. Much more people must suffer from such an accident if it occurred in China or India. Who can guarantee that such tragedy would not happen on the purposely sequestrated CO2? Therefore, the CCS strategy is totally pale and weak to deal with the global carbon emission. Figure 1. Compilation of industry CO2 capture cost estimates . Notes: --Based on over 20 different facilities from over 10 company interviews, plus information from other recent studies; --Cost ranges represent geographic, technological suitability as well as Greenfield versus retrofit considerations; --$ are 2008 CDN, based on levelizing real 2008 Capital and real 2008 Annual Operating costs discounted at 10% from year(s) incurred; --$/tonne abated includes cost penalties for make-up production and incremental CO2 emissions resulting from CO2 capture; --Gasification excludes cost penalty, if any, associated with production technology choice relative to alternative(s); --Benfield excludes cost penalty, if any, associated with production technology choice relative to alternative(s). Figure 2. 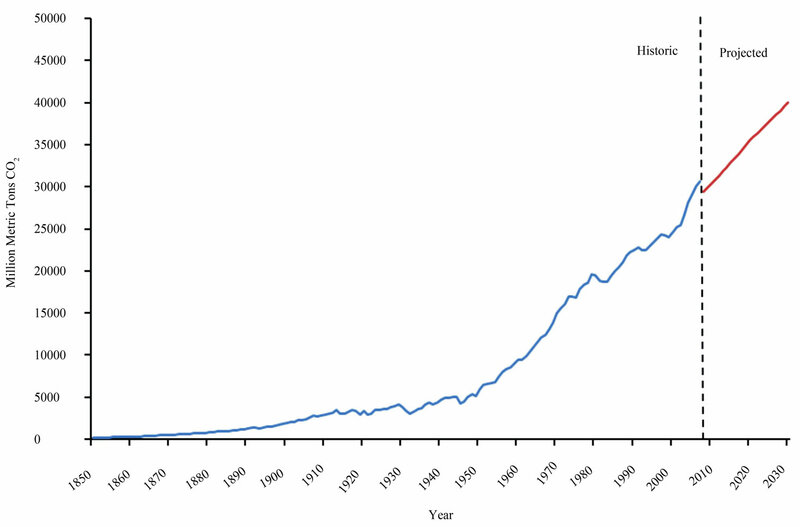 Global carbon dioxide emission for 1850-2030 . Figure 3. Correlation between global CO2 emission and world population since 1850.
therefore, the correlation reveals an ecological rule: the global carbon dioxide emission is linearly correlates to the world population when the latter is larger than 1.3 × 109, no matter how much have the industry and technology developed during the past 160 years. The ever-increasing carbon emission is not a natural phenomenon, nor is something can be technically governed. It is the total world population that controls the global carbon dioxide emission, although there is a big difference in the per capita emissions between developed and developing countries. This is the nature of the problem, which must be taken into account in the development of low carbon economy. “Carbon Dioxide Emissions from Power Plants Rated Worldwide,” Science Daily, 2007. http://www.sciencedaily.com/releases/2007/11/071114163448.htm. Alberta CCS Development Council, “Report: Alberta CO2 Capture Cost Survey and Supply Curve,” Ian Murray & Company Ltd., Edmonton, 2008. Center for Climate and Energy Solutions, “Historical Global CO2 Emissions,” 2012. http://www.c2es.org/facts-figures/international-emissions/historical.